The day’s best games came in the night contests. Texas A&M roared back from 10 points down in the last 30 seconds to force overtime and won it over Northern Illinois in a second extra period. And Wisconsin nailed a buzzer-beating 3 to survive and advance. 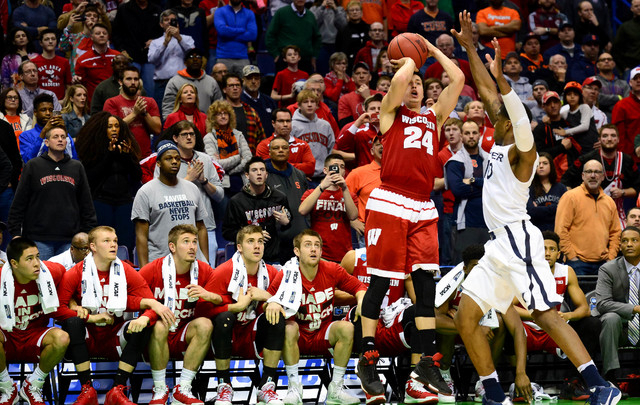 ST. LOUIS — Bronson Koenig hit two 3-pointers in the closing seconds, the last of them as the buzzer sounded, and Wisconsin edged Xavier. The talented sharpshooter who failed to hit from beyond the arc in a first-round win over Pittsburgh connected from well beyond the 3-point line to tie it at 63 with 11.7 seconds remaining. Edmond Sumner brought the ball up court for Xavier (28-6), and then drove to the basket, running over the Badgers’ Zak Showalter and getting called for an offensive foul with 4.3 seconds to go. Wisconsin (22-12) called timeout after crossing half court and coach Greg Gard drew up a play for his best outside shooter. Koenig got the inbounds pass in front of his own bench and buried the fallaway shot, sending the jubilant Badgers streaming onto the court and into another Sweet 16. NEW YORK — Rex Plfueger tapped in a miss with 1.5 seconds left and Notre Dame survived a valiant effort by Stephen F. Austin to reach the Sweet 16 for the second consecutive season. 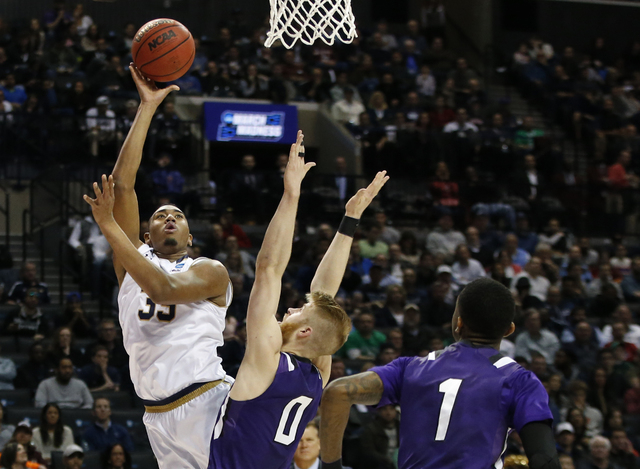 With 17.5 seconds left, Notre Dame grabbed an SFA rebound down one and put it in the hands of Demetrius Jackson. The point guard drove to the basket and missed. Zach Auguste followed for the Irish (22-12) but could not convert. The ball slipped off the rim and with one hand Pflueger flipped it in for his only basket of the game. A long heave from Stephen F. Austin (28-6) went wide and Notre Dame celebrated by swarming Pflueger. The Irish advance to play Wisconsin Friday. Thomas Walkup, the hero of Stephen F. Austin’s first-round upset of West Virginia, scored 21. NEW YORK — Josh Hart scored 19 points and second-seeded Villanova advanced to the Sweet 16 for the first time since 2009 with a rout of Iowa. Villanova’s senior class, led by Ryan Arcidiacono and Daniel Ochefu, made it to the tournament’s second weekend for the first time. They were upset in the round of 32 the last two seasons and didn’t make it that far as freshmen. The Wildcats (31-5) will meet third-seeded Miami on Thursday in Louisville, Kentucky. There was no doubt in this one. Villanova led 54-29 at halftime and by as many as 34 points in the second half. The closest Iowa (22-11) got was 16 points in the final minutes. 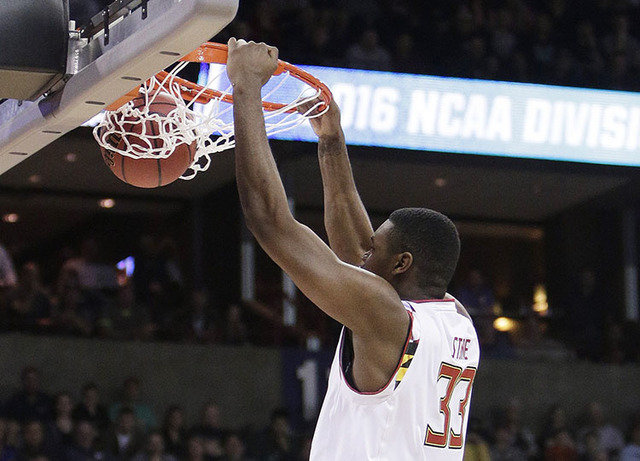 SPOKANE, Wash. — Melo Trimble scored 24 points and grabbed eight rebounds as Maryland beat Hawaii. Diamond Stone added 14 points for Maryland (27-8), which advanced to the round of 16 for the eighth time in the past 22 years. Mike Thomas had 19 points and 11 rebounds for Hawaii (28-6), which won a tournament game for the first time this season. Maryland will play Kansas next Thursday. 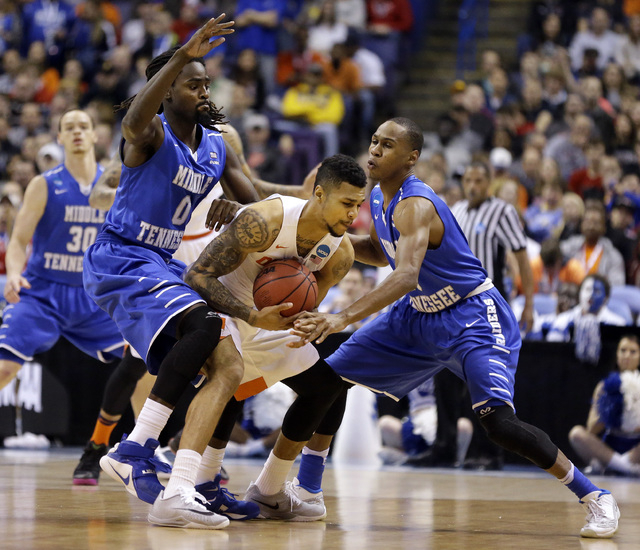 ST. LOUIS — The insufferable zone of Syracuse ground Middle Tennessee State’s magical March ride to a halt, and the Orange beat the Blue Raiders. Michael Gbinije poured in 23 points, Tyler Lydon added 14 and the Orange (21-13) used a 21-2 charge midway through the second half to crack open a close game and join five other ACC schools in advancing to the third round of the NCAA Tournament. After teetering on the bubble a week ago, they’ll play No. 11 seed Gonzaga on Friday in Chicago. The Blue Raiders (25-10), who shredded so many brackets with their upset of second-seeded Michigan State, made things tough on Syracuse for a while. They led early in the second half and still trailed just 40-39 with 16:02 to go, but proceeded to make one of their next 16 field-goal attempts. 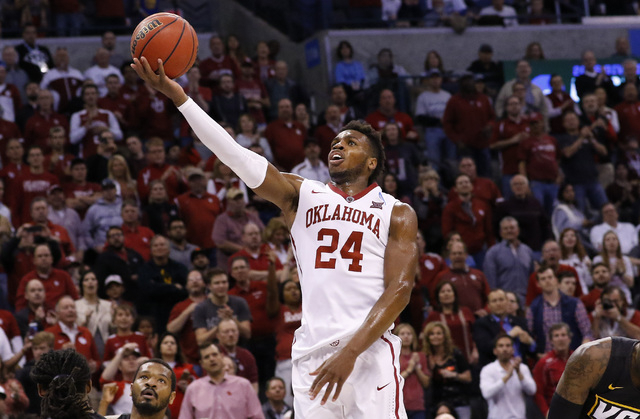 OKLAHOMA CITY — Buddy Hield scored 19 of his 36 points in the final eight minutes to help Oklahoma hold off VCU. Hield, who didn’t score for more than 10 minutes to start the game, made 9 of 12 shots in the second half after going 2 for 8 in the first. The senior guard posted at least 30 points for the 11th time this season. Jordan Woodard scored 17 points and Isaiah Cousins added 15 for the Sooners (27-7), who advanced to the Sweet 16 for the second straight year. They will play either Northern Illinois or Texas A&M. Melvin Johnson scored 18 of his 23 points in the second half, JeQuan Lewis scored 22 points and Michael Gilmore added 12 for VCU (25-11), which was trying to reach the Sweet 16 for the first time since its Final Four run in 2011. 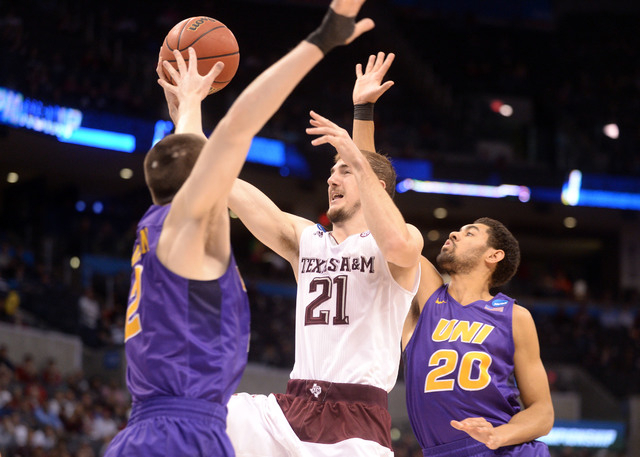 OKLAHOMA CITY — Alex Caruso scored 25 points as Texas A&M overcame a 10-point deficit with less than 30 seconds remaining in regulation to come back for a double-overtime victory over Northern Iowa. The win puts the Aggies (28-8) in the Sweet 16 for the third time in school history, the first since 2007. Jeremy Morgan had career highs of 36 points and 12 rebounds to lead the Panthers (23-13), who led 69-59 in the final minute of regulation before committing four turnovers in the final 29 seconds to spark the Aggies comeback. SPOKANE, Wash. — Dillon Brooks scored 25 points to leading Oregon over Saint Joseph’s in the second round of the West Regional. Oregon (29-6) was carrying the banner for the rest of the Pac-12 after the conference posted a collective dud on the opening weekend. 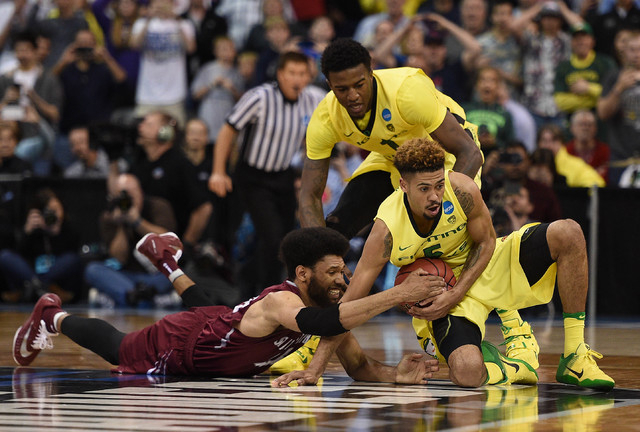 Five teams were sent home in the first round and Utah was routed by 11th-seeded Gonzaga in the round of 32, leaving the Ducks as the lone conference representative. And they were tested by the Hawks, rallying from down 58-51 in the final five minutes to advance to the Sweet 16 for the first time since 2013. Brooks started the rally with a driving three-point play and put Oregon in front for good on a 3-pointer with 1:19 remaining. DeAndre’ Bembry led the Hawks (28-8) with 16 points.